Note: Summer is defined as May through September; winter is defined as November through March. 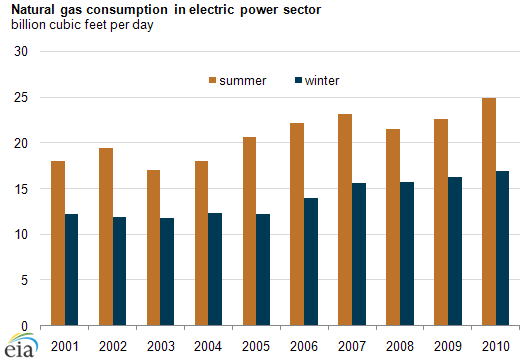 Natural gas consumption in the electric power sector in the summer of 2010 was nearly seven billion cubic feet per day (Bcf/d) greater than during the summer of 2001—an increase of 38%. The volume of natural gas used to generate electric power during the winter also grew 38% over that same period—up nearly five Bcf/d since 2001. Natural gas-fired electrical generation increased 44% between 2001 and 2010; the disparity between increases in gas burn and generation is due to increased efficiency in natural gas-fired units. Nearly 237 gigawatts of natural gas-fired power generation capacity were added between 2000 and 2010, representing over three-fourths of total generation capacity additions over that period. Since 2005, the Nation's fleet of natural gas combined-cycle power plants is contributing significantly more to baseload electricity needs. Additionally, natural gas combined-cycle power plants operate highly efficiently, allowing plants to generate a greater volume of electricity per unit of natural gas burned. Largely due to gains in domestic natural gas production from shale plays, natural gas prices in 2010 were relatively low.